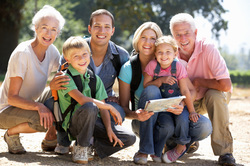 Family Reunion RV Rental - RV Rentals Dallas - Southwest RV Rentals - Luxury RV Rentals in Dallas - Ft. Worth with Unlimited Mileage! Cross-State or Cross-Country, our RV's can bring your family together in Safely and in Style. Luxurious and Comfortable RV's are perfect for Family Reunions and Family Reunion trips, no matter the distance. Our fleet of RV's can comfortably seat up to 10 people with room for Entertainment and Fun. You know your family is safe in an RV from Southwest RV Rentals. We have our RV's and Campers routinely maintained and cleaned. You will never leave our lot in an RV that isn't of "New" Quality. We deep clean and sterilize before and after each trip. Nor will you find a bald tire or oil needing to be changed. We keep a close eye on all our vehicles so that you can have the safest trip possible. Call today to reserve a camper or RV - or simply for more information on how we can help you make your next destination trip more comfortable.